Overclockers and hardware enthusiasts will soon see a new high-end CPU cooler on the market thanks to a company called DeepCool. The new product is known as Lucifer and hints it can cool a CPU as hot as hell. Indeed this might be the case as the Lucifer is one mighty CPU cooler. It measures 140 x 136 x 168 mm and weighs 1097 grams. 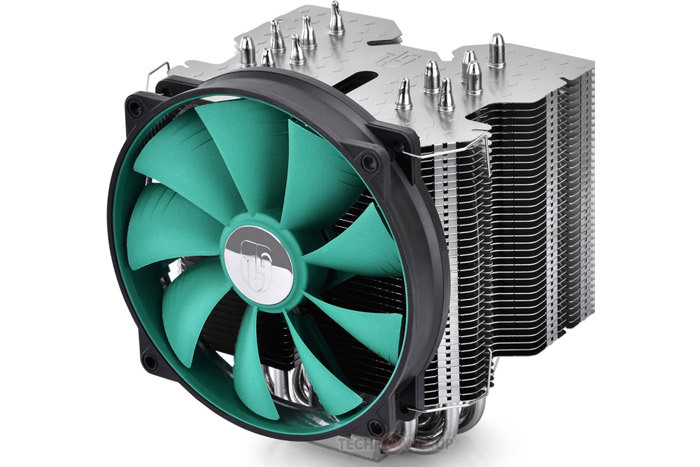 The cooler is capable of cooling all modern AMD and Intel processors thanks to six 6-mm nickel-plated copper heat pipes that connect to the copper base of the cooler (also nickel-plated) and to the aluminum heat sink fins. A large 140 mm cooling fan that spins at 700-1400 rpm cools the entire thing by pushing up to 81.33 CFM at noise levels that range between 17.8-31.1 dBA. The DeepCool Lucifer will first hit the market in Asia where it will be part of the company’s GamerStorm line. Pricing is unknown as of now.